This is a fun blog with helpful recipes. The thing I love is that if you are in a hurry you can forward the shopping list to your phone and stop at the grocery store on you way home from work. If you don't like one of the meals, substitute it with your own. You can even take time to create your own calendar. This site fits any grocery store. The best part is it is free! My kids are an interesting bunch. They are all very talented but most of them are also very lazy. I really have a hard time motivating them to practice consistently. Sure most of them will practice real hard if a big rodeo or finals is coming up. I just don’t think that works really well as opposed to a consistent practice all week/month/year long. Shane my 13 yr old is the easiest to get to practice and it is much easier to motivate then the others. It may be that he really LOVES rodeo. We have always said that he was born 100 years too late. Anyway with Shane (and all the kids really) we have a practice grid that includes all of his rodeo events broken down into areas and the horses that he rides in each one. 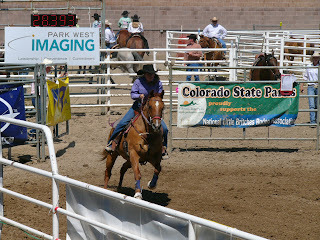 It also includes each day of the month and rodeos that are coming up. 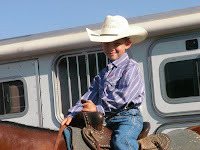 Since he participates in 3 different rodeo associations, he has a lot of different events that he does. 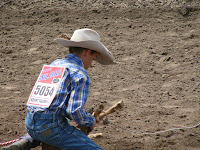 If you can see the upcoming rodeo and know what events are coming up, he can then practice for those events harder. We don’t practice everything every day. That would become an unbearable practice. We would be out there for 8 to 9 hours daily with the 9 events he does between the three associations. He will ground rope and tie our dummies daily for a few minutes each day. He will ride the horse daily to condition her. He will practice other items every other day depending on what he needs the work on. He is really good on getting off the horse so we don’t practice that as often. I have also found that a lot of the main ideas behind each event have the same theory and that if you practice ground roping for breakaway with a little bit of a change it also works for team roping. Shane just needs to know what the change is and do it consistently and be aware of what he is practicing for. A good rule of thumb for a rodeo mom is to have a vet kit at hand. You never know when you are going to have to clean, dress and administer a little helping hand to your best ride or someone else in the rodeo family. First of all a prayer in your heart that you will be able to fix what’s broken – that’s instinct really for all mom's I know. These are items that I have on hand for all types of mom – vet work! Which is a human product but works great. 19. Scissors – hair cuts? These are items that I seem to use year around. There are some great websites that go along with these products, and all of these you can purchase at a feed store or the vet. No matter what barrel race we attend there are always a hand full of horses that refuse to go in the gate. Some whirl circles, others rear, and still others run backwards faster than a lot of horse can run forward. We all dread these horses, many of us have had a problem gate horse, and all of us know that this behavior is neither fun nor safe. So, what do you do if you have a horse with a gate problem? There is no simple solution, but first and most important I that you know your horse. When trying to find the cause and then the cure for a gate problem, there are several areas I like to cover and in order to come up with the right answers I have to know my horse. In my opinion, the reasons for gate problems can usually be lumped in to one or more of three categories. The first thing we need to ask is “Why am I having a gate problem?” In general, horses do not disobey just to be “bad”. There is almost always an underlying issue. Has your horse always had a gate problem? Or is this a new issue? The following is a short version of the process I go through to help identify the source of a problem. Your horse must respect you. If you don’t have the respect of your horse, you can’t begin to fix any problems. When you are not entering a gate, do you always have control of you horse? If the answer is no, this is probably the best place to start. Horses get excited and nervous, this is normal, but if your horse is not listening to you when he is at home and you are working then you are asking for gate problems. There are a few exercises I do to check for control. No matter where I am or what speed I am going, when I want to stop my horse I need to be sure I can. To do a brake check, start at the walk and periodically ask your horse to stop. If from the time you say whoa and ask him to stop until the time he actually does is more than two or three steps, you need to work on your whoa. 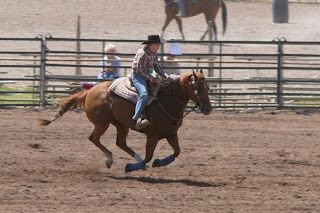 Gradually speed up this exercise until you are at a good paced lope. Even with speed, I expect a horse to stop within a few steps. Second, check to see how responsive your horse is to the bit. When you ask for his head either to the side or to give straight back, does he give willingly? If you ask and he quickly gives at the pole and follows the bit, then you are probably ok. If you have to use a great deal of force to get a little reaction, your horse is not listening and you need to spend some time softening your horse. When you ask your horse (no matter what speed) to move whether it is forward, backward, or to the side; does he do so quickly? If the answer is yes, you are probably ok on this exercise. If he takes time to move then you have some work to do. This is a good indicator of both respect and training level. If you can not get your horse to move off of your legs and other cues at home, it makes perfect sense that he would not want to do so under stress conditions. I suggest you check these skills as one of the first steps in identifying a gate problem. Pain and or injury can also be a major reason a horse does not want to go in to a gate. Think about it, if you knew you were going to do something that was going to really hurt you would you be really eager to go and do it? Likely not, and your horse is no different. Also, it is so important to make the gate a happy place. I suggest you haul your horses to a lot of practices before actually running especially if you get nervous or the horse is new to the sport. Spend a lot of time going in and out of the gate with no pressure at all. When you are done practicing or competing walk the horse back to the gate. Dismount at the gate. Loosen their cinch and take off their boots. This will make them look forward to going to the gate. As you look at each week, you may feel overwhelmed with so many things to get done. As a rodeo mom, you have daily mom duties but you also have to make sure that your chores are done daily and you get your kids to practice. This week for example, not only do I have to work a normal work schedule but we leave on Thursday for a High School Rodeo that is all day Friday and Saturday. In addition to working, I need to get the all the laundry done, go to the grocery store, pack the trailer and get my daughter to practice on Monday and Wednesday and be ready to leave Thursday as soon as I get home from work. Here are some tips to help get you through it and get motivated to do more. First, congratulate yourself. Women are amazing. We are great at multi-tasking. Although I may be stressed about it today, by Thursday when I leave I know I will have everything ready and we will have a great weekend at the rodeo. Second, can I mention lists? The best way to get things done is to know exactly what you need to do. So today before I leave work, I will make a list of all the things that need to happen by Thursday. Also when, I clean and go through the trailer we are staying in, I will make a list of things that need to be bought before we go. You should also prioritize the list. There is always too much to do. So make sure you only do what is important. There is always a great sense of accomplishment when you get mark things off of the list. Third, put your priorities on a schedule. Most people waste a lot of time because things are not scheduled. If you break your tasks up into manageable pieces of time, you will get a lot more done. Also, you need to learn to set time limits for things. For example, tonight we only have 2 hours for practice because we need to get home and start cleaning the trailer. So only practice for 2 hours. It is way easy to let things go beyond schedule but if you stick to it, I promise you will get more done. Fourth, reward yourself. One of my favorite rewards is to do absolutely nothing Sunday morning when we get home from a rodeo. Really. I make some coffee in the morning, grab a blanket and watch HGTV for a couple of hours. Yes I don’t watch anything horse related. Or I pop in a movie usually a chick flick. Then when I have chilled for a little while I will get my children back to work, clean the trailer and deal with everything else left over after a rodeo weekend.